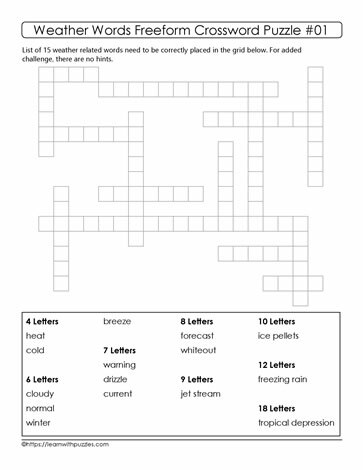 Challenge students' brains with this freeform crossword puzzle about weather. To solve the puzzle, place all of the words in the list below in the correct place in the grid. To help get started, find a category of words with either the least number or most number of letters and record those in the grid. Continue solving by finding common letters between words and record those words in the grid. This puzzle suits learning for home schoolers, regular classes as well as great family fun!